Here's a look at the live status of every Bay Area BikeShare station, including bikes available, capacity, and number of open racks. Open racks are important, as you can't return a bike to a full kiosk. An interactive vizualization of station connection data, representing both were each ride began and ended. An interactive map of the home zipcodes of SF Bay Area BikeShare users, along with additional statistics. 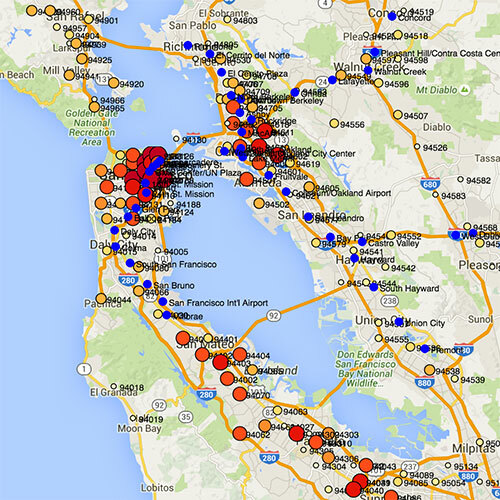 An interactive map of the home zipcodes of SF Bay Area BikeShare users. 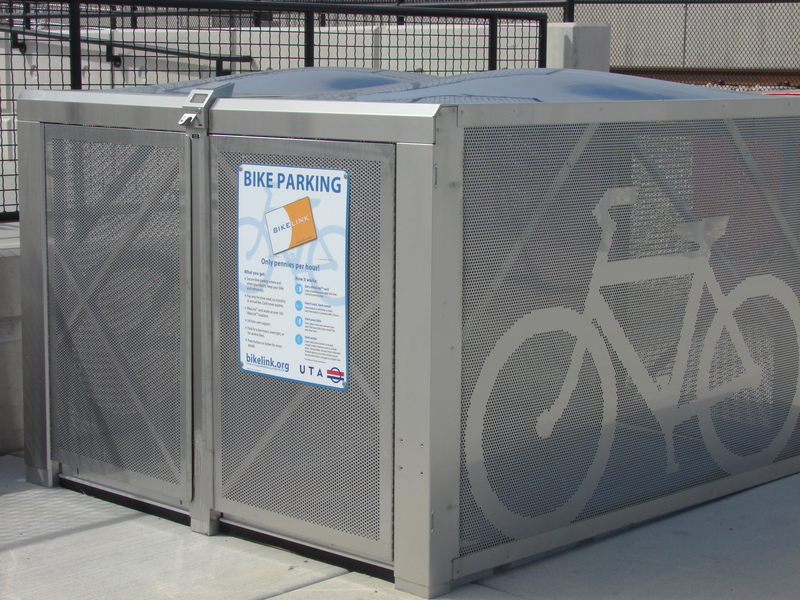 An overview of other Bay Area cycling resources, including BikeLink lockers and commercial bike rental options. 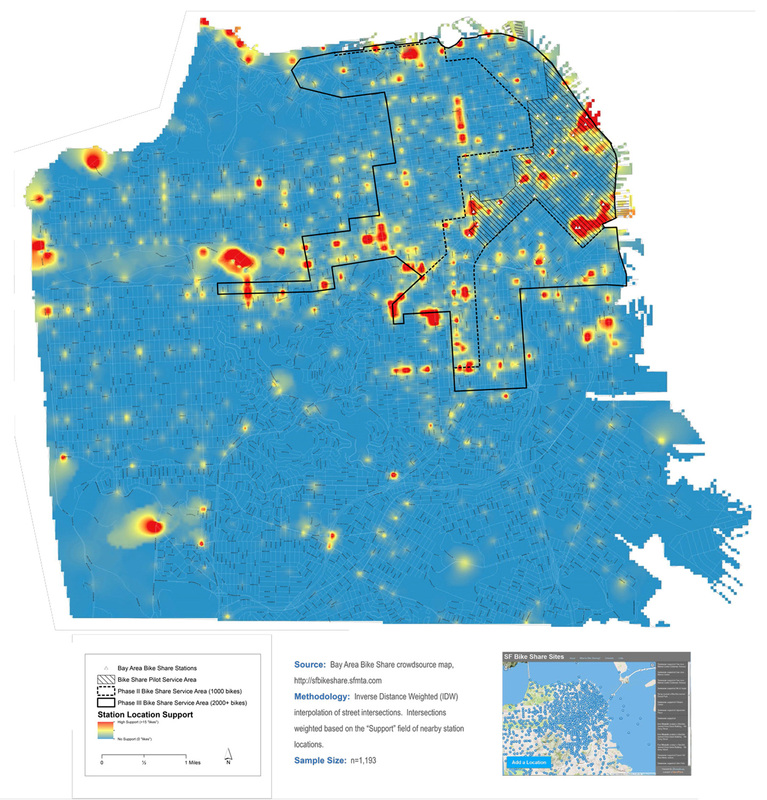 Crowdsourced heat map of suggested new locations to serve San Francisco, based on thousands of recommendations. Crowdsourced heat map of suggested new locations to serve San Francisco, based on thousands of recommendations. Select for larger image. 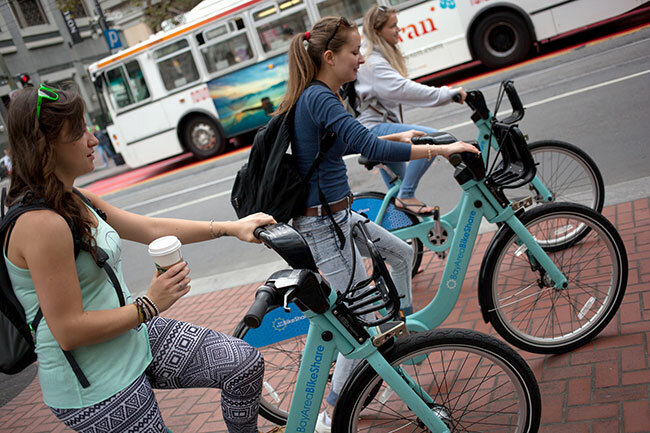 The current expansion of the system will bring BikeShare to Berkeley, Oakland, and Emeryville, for the first time. The upcoming ten fold expansion of the system will bring the program to Berkeley, Oakland, and Emeryville, for the first time. However, due to minimal local useage, Redwood City is likely to leave the system. How to use the system, including pricing information, and what to avoid. A one-day pass starts at $9. $9 day membership allows for unlimited rides of less than 30 minutes each. After the initial 30 minutes, it's an additional $4 for the following half hour, and another $7 for every half hour after that. If you're looking for a bike to tour around town for more than an hour or so, you should definately look at commerical bike reantal options. 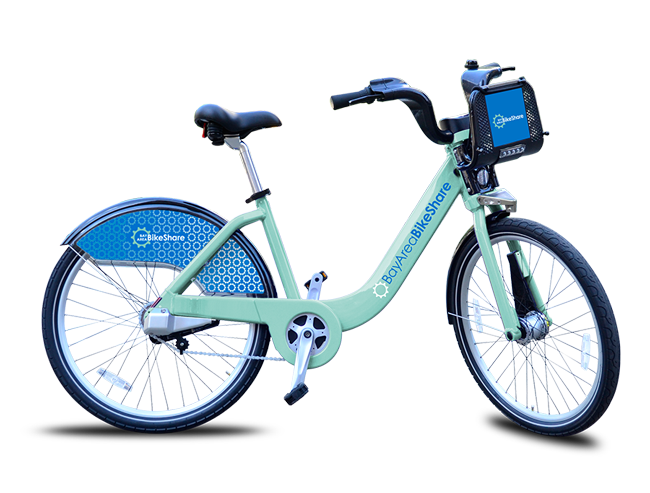 A full day rental should cost less then $40, thereas a full day BikeShare would run well over $100! Mouse over each station to see how many rides begin there, and where those trips ended. Interesting facts from the SF Bay Area BikeShare 2015 data set. Nearly 80% of riders purchase an annual subscription ($88). The remaining 20% purchase a 24-hour ($9) or 3-day pass ($22). About 50% of the current kiosks are located in San Francisco. Yet, the City makes up for 90% of regional usage. 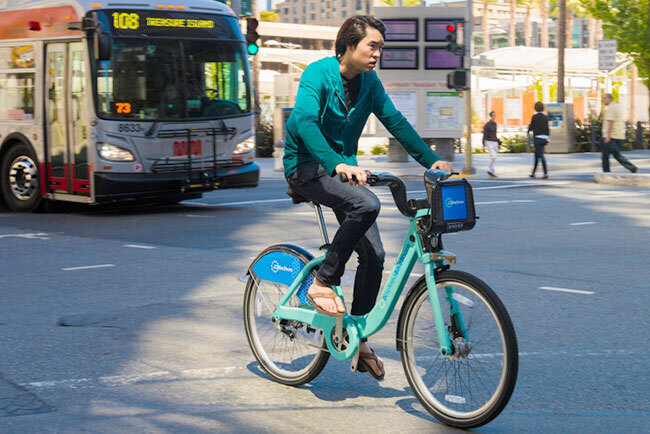 Usage increased by 7.3% from 2014 to 2015, during a time of no significant changes to the level of service, or number of bikes. Overall usage drops by 52% on the weekends. Tourists and occasional riders are then on par with yearly subscribers. The most common ride duration is 5 to 10 minutes. 96% of rides last less then 30 minutes--the point when over-charges apply. Typical rider? San Francisco user who commutes via CalTrain, when it isn't raining, and rides for 10 minutes at a time. 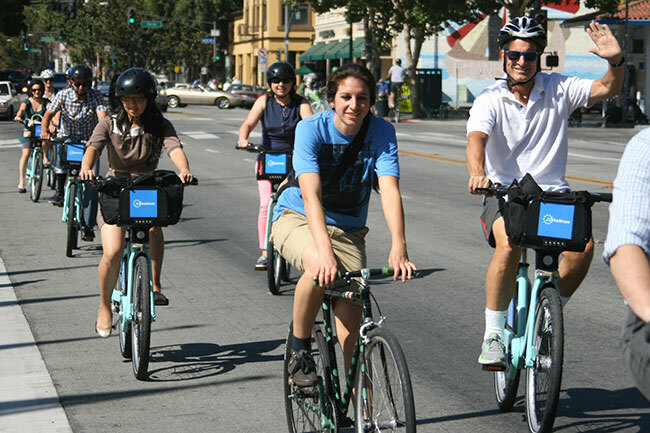 Bay Area BikeShare is growing by x10! 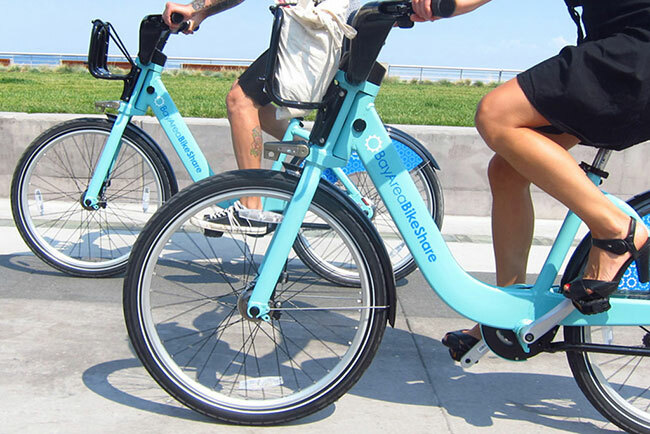 A system expansion of the original 700 bike launched in the Fall of 2013, to over 7,000 bikes, is currently underway. The new bikes and stations are expected to be in place by the end of 2017. In addition to signifcantly increasing in SF, the system is launching for the first time in Berkeley, Oakland, and Emeryville. Monday, July 25, 2016, at 6pm. It's my hope that this app will contribute to awareness of this fantastic resource. I’m excited by the growth of cycling infrastructure, such has separated bikeways, BikeLink lockers, and this growing regional BikeShare program. If you find a full station, insert your key at the kiosk and tap "Full Station" for an extra 15 minutes of riding time.